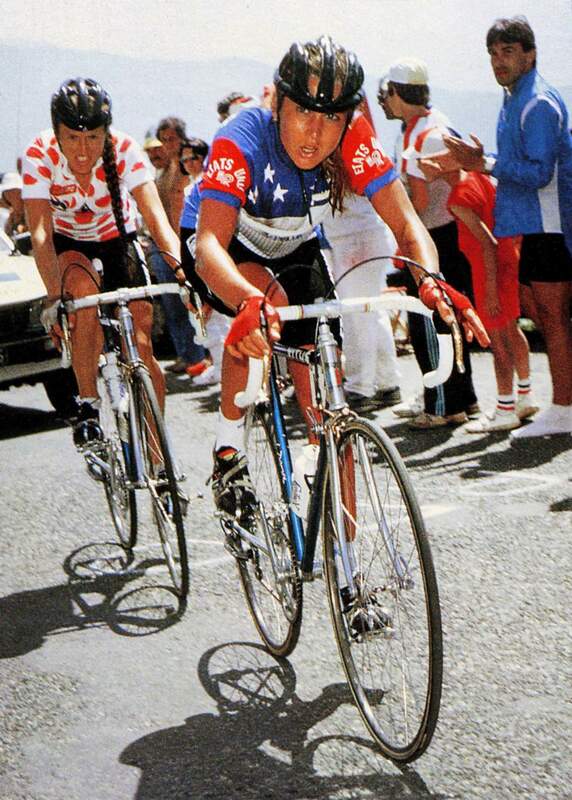 Deborah Shumway leads U.S. teammate Bette Wise-Steffan up La Plagne during the 1984 Tour de France Feminin. Shumway, who placed third overall in the 21-day event, still recalls the fans screaming encouragement on the Tour’s famed climbs. If you watch women racing bicycles on the Champs-Élysées today, know that this is by no means a first. Just ask Durangoan Deborah Shumway. She’s not one to brag, so you might have to coax it out of her, but she was there, 30 years ago, when women first shared the spotlight with the men at the Tour de France – not for just a day, but for three grueling weeks. Today’s 56-mile women’s race, called La Course by le Tour de France, is being touted as a coup for women’s cycling. No doubt, that’s true. And women’s cycling proponents are joyful to have their sport in the spotlight. The race will end today on the famed Champs-Élysées just a couple of hours before the men’s event concludes. But in 1984, the world’s top women road cyclists rode each of the stages on the same course as the men. It was called the Tour de France Feminin. Shumway, then a 29-year-old up-and-coming rider on the U.S. team that was picked for the race, recalls it vividly. It was a rich experience, although not financially. One of the highlights was the rabid fans encouraging riders along the course, particularly on the big climbs. Women rode the same courses each day as the men, but not quite as far. They would drive up the road to the start, then ride the same passes and have the same finish, Shumway said. Their finish would be 30 to 60 minutes before the men’s. The schedule was not relaxed. It was like a 21-day job, Shumway recalled. “Every morning you’d eat your croissant, drink your coffee, or whatever, then you’d chammy up and go to the starting line,” she said. In all, it was about 700 miles of racing. Shumway’s overall third-place finish put her on the podium in Paris. “That was one of the most amazing days of my life,” she said. On the podium with her was not only her teammate and overall winner, Marianne Martin, and second-place finisher Heleen Hage of the Netherlands, but the men’s top three, as well – cycling legends Laurent Fignon, Bernard Hinault and Greg LeMond. Just a week later, women’s cycling got another huge boost, with the inaugural women’s road race being held at the 1984 Olympics in Los Angeles. Shumway was not a participant at the Olympics but says she is glad she was in the Tour de France Feminin instead. Shumway returned for the 1985 Tour de France Feminin. She also raced in the Coors Classic three times. In 1982, as a warm-up for the Coors, she raced in the Iron Horse Bicycle Classic – and won. After her participation in the women’s version, she became a big fan of the Tour de France. She and her husband, former world mountain bike downhill champion Greg Herbold, have been back three times to watch the men’s tour. The Tour de France Feminin continued annually until 1989 and was held again from 1992 through 2009. In 1998, it changed its name to the Grande Boucle because of a name rights dispute with the men’s Tour de France. Through the years, the race became smaller until it finally disbanded. Durangoan Carmen Small, the 2013 national time trial champion, will participate in today’s race. In a recent interview with the The Durango Herald she noted its importance for women’s cycling. It will be shown live on Universal Sports Network at 5:30 a.m. MDT. Universal is not available from local cable providers but is available from satellite provider DirecTV. Some women’s cycling supporters bemoan the lack of a tour for women in France. “It’s a scandal there isn’t a Tour for women at the moment,” Olympic and two-time Grande Boucle champion Nicole Cooke of Wales said in an interview recently with BBC Breakfast. Shumway considers herself lucky to be involved in women’s cycling at the time. She is hopeful that today’s La Course by Le Tour de France will boost women’s cycling.